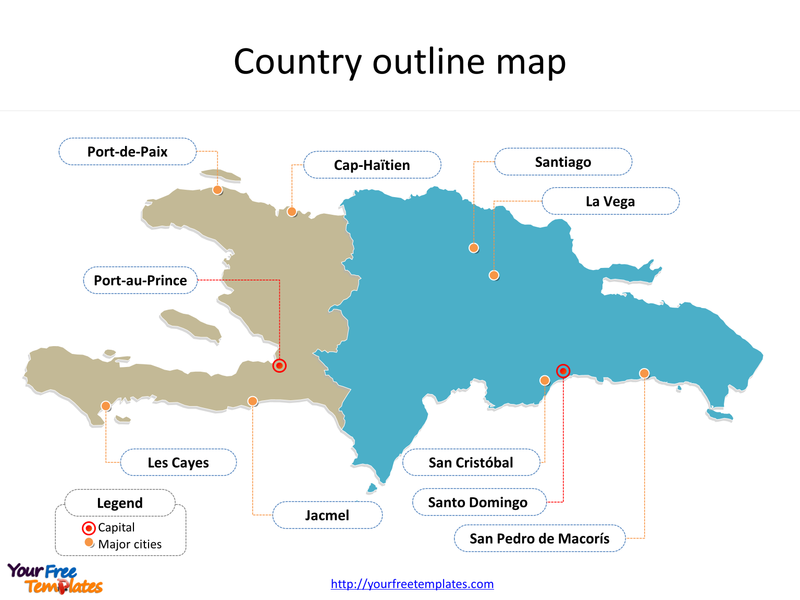 The Map of Hispaniola Template in PowerPoint format includes two slides, that is, the Hispaniola outline map and Hispaniola political map. Firstly, our Hispaniola outline map free templates have major cities on it. There are 2 countries in our Hispaniola map free templates, namely, Haiti and Dominican Republic. The Hispaniola Map free templates include two slides. Our Map of Hispaniola is for the island in the Caribbean island group known as the Greater Antilles. To begin with, Hispaniola is the second-largest island in the Caribbean (after Cuba), with an area of 76,192 square kilometers (29,418 sq mi), 48,440 square kilometers (18,700 sq mi) of which is under the sovereignty of the Dominican Republic occupying the eastern portion and 27,750 square kilometers (10,710 sq mi) under the sovereignty of Haiti occupying the western portion. Then the major cities in Hispaniola are including Santo Domingo, Santiago, La Vega, San Cristóbal, and San Pedro de Macorís for the Dominican Republic; Port-au-Prince, Cap-Haïtien, Les Cayes, Port-de-Paix, and Jacmel for Haiti. 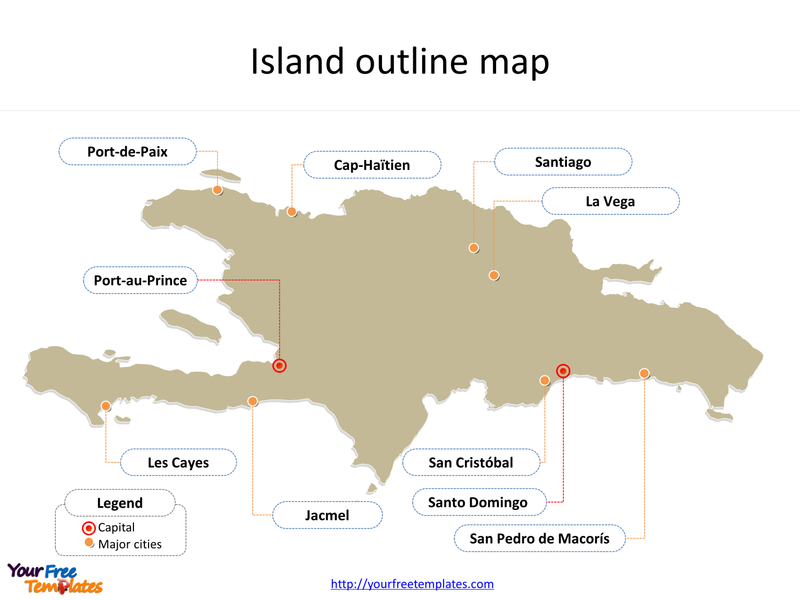 You can find them in our Hispaniola map free templates. It is noted that Cuba, Hispaniola, Jamaica, and Puerto Rico are collectively known as the Greater Antilles. What is more, every individual political subdivision is an editable shape. The labels and shapes are grouped by layers. In a word, you can change the texts, colors, sizes, highlight some map shapes, and add your charts. At the same time you can also refer to the fully labeled Map of Hispaniola in Wikipedia. Believe it or not, analysts from marketing research companies, consultants from professional firms think highly of our website yourfreetemplates.com; most important of all, and our maps can help to reduce their efforts and create attractive maps.